This is the tenth Purana that I am reviewing. Its name is the Markandeya Purana as you know. It is actually the shortest Purana. It has only nine thousand shlokas. I noticed that the last three Purana reviews that I had written were all satvik puranas, puranas that glorified Vishnu. I decided that it was time to move on to another type of Purana. I felt I had not written about rajasik puranas, puranas that glorify Brahma apart from the Brahma Purana. 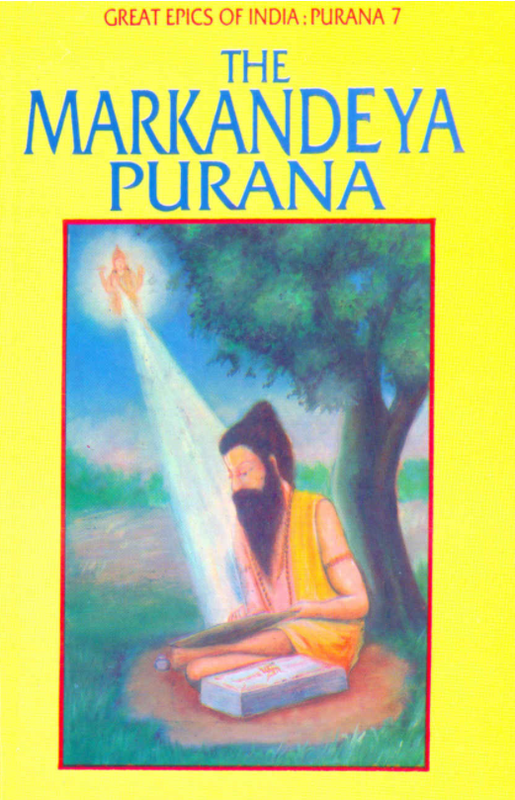 Between the rajsik puranas I decided to review the Markandeya Purana. This Purana was actually narrated by four birds to the sage Jaimini. Well, how did this happen and who were these birds who could talk. There was once a rishi named Drona who married a woman named Tarkshi. One day, Tarkshi went to Kurukshetra when the great war between the Pandavas and Kauravas was happening. Arjuna and Bhagadatta were fighting when one of Arjuna’s arrows hit Tarkshi in the stomach. She died but four eggs fell out of her stomach. Bhagadatta’s elephant had a bell around his neck. A stray arrow sliced it off and it fell over the eggs protecting them till the end of the war. After the war ended a sage called Shamika found the birds and took care of them. They learnt to fly and speak. They bowed to Shamika and asked him to teach them the true knowledge. They then went to live at Mount Vindhya. There is more to the story about how the birds could speak but that is for another time. Sage Jaimini went Rishi Markandeya about some doubts and questions he had regarding the Mahabharata. Markandeya said that he was busy with his tapasya and asked Jaimini to go to the four birds living on Mount Vindhya. Jaimini went there and had a long discussion with the birds regarding his doubts. The Markandeya Purana was also narrated. The Markandeya Purana had many stories. Most of the stories were about the lines of kings who then became Manus later. Each manvantara or era is ruled by a Manu. There are many manvantaras. We are currently living in the seventh manvantara. I also learnt another fact. The very first Manu in the first era was Svayambhuva Manu. The next five Manus it seemed were related to Svayambhuva Manu himself. As I already told you there were so many stories I couldn’t decide which one was my favourite. I then read a story that describes the killing of the two asuras Madhu and Kaitabha. I will narrate that to you now. Once after a whole kalpa had gotten over, Vishnu was sleeping on the endless abyss of water. While he was sleeping two asuras named Madhu and Kaitabha emerged from his ears. They started coming towards Brahma who was sitting on the navel of Vishnu. Brahma saw them and hoped Vishnu would wake up but he didn’t. In desperation Brahma prayed to Mahamaya, the goddess of illusions who was located in front of Vishnu’s eyes. Mahamaya heard the prayers and came out through Vishnu’s nose, arms, eyes, mouth and chest. She had been keeping Vishnu asleep so when she came out Vishnu woke up. Vishnu saw the asuras and wrestled with them for five thousand years. Mahamaya helped Vishnu by deceiving the asuras using her maya. They soon got so deceived that they granted Vishnu a boon. Obviously, Vishnu asked for the boon that he would be able to kill them. Trapped, the asuras tried one last attempt in saving their lives. They said Vishnu could kill them in a place where there was no water. This was clever of them as the whole place was a never-ending abyss of water. But, Vishnu was cleverer. He took them onto his thighs which were completely dry and killed them with his discus. I was really happy after reading this story. One of my questions had been answered. I had always heard of the two asuras and knew that Vishnu had killed them but I didn’t know how. I was delighted to find the answer in this story. I loved reading it because it had so many interesting stories in it. It is said to be sacred and if you read the stories written in it you get a long life, all your sins are forgiven and all your life’s objectives are fulfilled. This was a very interesting Purana and it has now become my second favourite Purana after the Vishnu and Linga Puranas. The Bhagavata Purana has slipped down to third favourite.